» Bottle Bill: Higher deposits, but why? Bottle Bill: Higher deposits, but why? The Albany redemption center will open Aug. 20 at 2141 Santiam Highway S.E. Albany’s “BottleDrop” will open as scheduled, but not in time to prevent the state Bottle Bill from becoming more expensive to consumers in 2017. And the increase then may not be justified. Read on if you want to know why. 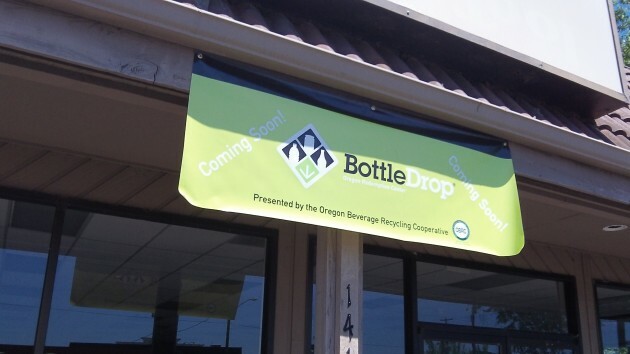 The Oregon Beverage Recycling Cooperative is preparing to open its Albany redemption center on Aug. 20. The idea is to increase bottle and can returns from all those people who now put them in the curbside recycling bins, or throw them away, rather than face the hassle of store returns in order to get back a few nickels. The opposite may also happen: Consumers who do use the return machines at the various stores — unpleasant as the experience can be — may just say the hell with it if they can no longer do that. About a dozen of the redempton centers already operate around the state, and there are plans for many more. They were authorized by the legislature, which wanted to make the Bottle Bill more effective. Among other things, the legislature said that if the container return rate falls below 80 percent for two years running, the deposit will double to 10 cents in January 2017. The Oregon Liquor Control Commission says the return was below that in 2013 and ’14, so now the increase in the deposit is all but certain — unless the 2016 legislature changes the law again. There is something fishy about the official container-return statistics. They are based on the number of containers returned for their deposits compared to the number sold. But that misses the containers people put in their recycling bins without worrying about the deposit. And those bottles and cans are being recycled just like the ones turned in for money. They don’t end up in the trash or along the side of the road, and thus the goal of the Bottle Bill is completely fulfilled. The deposit increase to 10 cents is supposed to encourage more recycling, but if the recycing is already being done, all the increase will do is raise the price consumers must pay for water, soft drinks and beer. I don’t know about your neighborhood, but I often see “homeless types” going through the recycle bins looking for returnables. Some are pretty good about leaving a mess and some aren’t. I think there’s more of the “recycle bin” returnables actually being turned in for deposit than one would think. I would also think Republic Services would be turning them in at $.05/ea. That’s a much better return than scrap price, especially for plastic & glass which I think they have to pay to get rid of. As a small side issue I believe that Republic crushes the class at their Knox Butte landfill and uses the glass on the roads on their property. The plastic I’m not sure. Regardless of deposit amount for glass containers, none of them are recycled. The glass is crushed and used in place of gravel in roads and parking around Coffin Butte. There is no value for waste glass, so the whole process is pure waste. To me, “recycled” means reused as a similar product. A question of definitions, I guess. Plastic bottles have long been turned into park benches and such, and that was considered a big advance in recycling. I think what Riehl has in mind would more properly be called “reuse.” Thanks for the comment. “Downcycle” is used disparagingly by eco-supporters for park-bench plastic and road glass. Who keeps the money for unredeemed deposits? OBRC? Beverage distributors? If the the unredeemed rate is over 20%, somebody is probably making a pretty nice buck for doing essentially nothing. Has this been quantified? If we pay a deposit when we buy the container and we get it back when we return them……..where does the money go for the containers that are not redeemed? Ah ha, into the state coffers? Add another nickel onto the deposit and the state makes more money. Kinda like a tax but not called the T word, huh? I look forward to the recycle center. The way it is now, a person has to visit multiple stores to find enough working recycle machines. Then if you have a person with a overflowing cart of containers in front of you, forget it. No wonder why people throw containers away now or put them in their home recycle. Thanks for clearing up who keeps unredeemed deposits in Oregon, although it would be helpful to know how much money is involved. The guide you referenced is interesting. Obviously it is pro government regulation when it comes to bottle bills. But the guide also does a good job of identifying who the opposition has been over the years. Clearly, the distributors, retailers, and recyclers do not support these bills. I’d like to hear more about their side of the issue. I believe that, at least some of the reason for not taking bottles into the redemption sites, so often they are not working or there is such a line that people don’t want to wait. Also, as far as road side litter consisting of cans/bottles, you can go for a stroll along most rural roads on a daily basis and find at least one, if not more, in the ditch. “Recycling” is a state of mind – some don’t mind, the rest don’t care. I am sure the return rate is much higher in Albany and my employer Kroger takes back a lot . Corvallis takes back more though due to OSU …not a big shock . I used the one on commercial street for several years and I love it and it’s convient . This is very good for Albany as well as the retailers . Oops. If I had read the next post before my reply about the use of crushed glass I could have saved a little time. One again, Jim has no clue about what he is talking about. So Jim, is this part of the United Nations conspiracy with the Albany City Council, as you use to talk about? Or is this a new group? And, if the UN isn’t at the very least peripherally involved, then why is the mayor involved in the UN council of mayors? Why does she advocate for the very ideas the UN’s council of mayors promulgates? Why are we a dues paying member of the UN’s ICMA “service” and use their software? Why do we follow ICMA’s advice and recommendations – receiving countless awards from them? I know it will require a little research on your part, but these things are all easily verifiable. Roger’s comment is spot on. And you’re telling “us” to get a clue? The return rate is going down because with the redemption centers, we are giving consumers fewer option to return the containers. The large grocers save money in not dealing with returns. The distributers make out big time as they get to keep the “deposit’ money. Oregon environmentalists get to wear their new badge of honor at their national events by raising the deposit to 10 cents. Everybody wins…….. except the consumer. All of this was projected when the bill passed the legislature. It was all about special interest financial gain. If the legislature seriously wanted to improve the situation they would have adopted the model currently being used in another state which is that the sanitation company simply does curbside redemption for every customer and credits their account for the value of every return. That system would in fact be a victory for the consumer. With the “deposit’ credit, many households would not have to write a check for their garbage bill very often. Such a system would beat the heck out of collecting cans and bottles in the garage and then trying to remember to take them to the redemption center on a regular basis. People forget that when initially implemented, retailers had a HUMAN that dealt with the return deposits. THEY bought the machines to save labor. THEY allow the machines to languish in a state of disrepair, making returning containers a pain. IF the recycling law had some “teeth” in it toward the retailers keeping it convenient to redeem your containers, a recycling center would never be needed. Something to the effect if you had X machines out of order or X people waiting, they would have to implement their HUMAN to take containers. The machines would be functioning a MUCH greater percent of the time. Not having a car, having to make a special trip to a recycling center is a wasted trip, since it’s out of the way of any stores I use. This gets much worse during foul weather. I have already reduced my purchasing of such containers greatly. Tap water is cheap by comparison. We take our empties to the Helping Hands Thrift store. They seem to welcome them and I usually have other things to contribute to their cause. I never have to bother with taking them to the grocery store or the coming recycling center. Works for us! You are still taking them somewhere, so the only thing you’ve gained is a quick drop of items you’ve paid for.